Ubisoft does Puzzle Quest with Might & Magic: Clash of Heroes, a manga-styled puzzle role-playing game hybrid coming to the Nintendo DS this August. 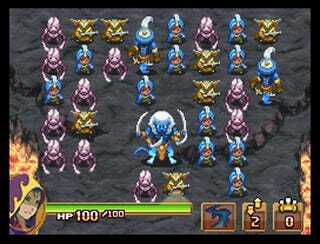 Developed by Capybara, the developers behind the recently revealed PSN rainbow puking game Critter Crunch, Clash of Heroes is a role-playing game set in the Might & Magic universe that replaces puzzle games for traditional RPG combat. Five epic quests await players as they explore the world of Ashan, customizing their armies and doing puzzle battle with the forces of evil. As you can see from the screens below, Capybara has used their considerable art talent to give the Might & Magic universe a rather please manga makeover, which should go a long way towards tempting new players to the franchise. They had me at puzzle RPG.